The holidays are just around the corner—and thus begins the race to deep clean your home before your subtly judgmental relatives arrive. From scented trash bags to vacuuming the dog himself, you’ll do everything in your power to help your guests enjoy their time in your home and not be distracted by odors or the itchy eyes, coughing, and runny noses caused by allergens. You can clean until the cows come home, but unless your air ducts are clean, there’s only so much you can do. You may be the greatest neat-nick the world’s ever seen, but regardless, the dust, pet dander, food, and debris all circulate through your heating system and will eventually land on your furniture, counter tops…and the table where you will be serving your holiday meal. 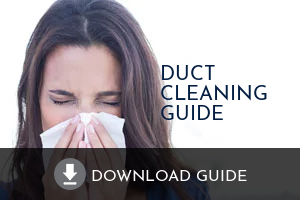 Cleaning your air ducts is the equivalent of cleaning behind your ears like your parents always reminded you growing up: you may feel clean, but without that extra step, you’ve still got dust and other specimens hanging around. Whether you’re hosting guests with allergies or those without, clean air ducts are a must for anyone who prefers not to decorate their serving table with a ‘Please Excuse Our Dust’ sign purloined from a construction site. Ensure that the appetizing smells of turkey, ham, or savory vegetables will be the only ones wafting through the house; not stale, musty air. Avoid that dreaded moment where your guests wrinkle their noses and you overhear them asking one another ‘what is that smell?’ Capital Heating & Cooling can help you breathe easy this holiday season. Our duct cleaning service will give you the gift of clean, fresh air to you, your family, and your guests. For those who do have allergies, your thoughtfulness will be the cause of immense gratitude, as anyone who has ever suffered quietly through the holidays with sneezing, coughing, runny eyes, or other allergy attack symptoms can attest. Things like this can ruin the holidays for the person enduring them, and also affects those around them such as family who may wish to leave early to alleviate their family member’s suffering – or the host, who may feel awkward at the obvious discomfort being experienced by a guest. It’s not worth the risk; settle in for the holidays with peace of mind knowing you’ve done everything you can for the comfort of your company by getting your air ducts cleaned. Did you know that cleaning your air ducts can also contribute to significant savings on your home energy bills? With cleaner, clearer vents, your heating and cooling systems reduce how hard they have to work to generate hot or cool air to the rooms of your house, thus saving energy costs to heat or cool your home. Capital Heating & Cooling employs only trained technicians whose primary objective is your complete and total satisfaction. As part of our regular air duct cleaning services, we can sanitize and use a sporicidin solution to thoroughly deodorize your air ducts. Our technicians use only top-of-the-line, state-of-the-art equipment to achieve the best possible results in the cleaning of your air ducts. Get that clean-behind-the-ears feeling in your home today; call Capital Heating & Cooling today at 262-735-5548 to schedule your air duct cleaning with one of our certified technicians now! Call our home heating experts at 414.384.4822, or contact us online to schedule your duct cleaning cleaning today.